This chapter introduces Rule Responder and its applications. Rule Responder is a framework for specifying virtual organizations as semantic multi-agent systems that support collaborative teams. It provides the infrastructure for rule-based collaboration between the distributed members of such a virtual organization. 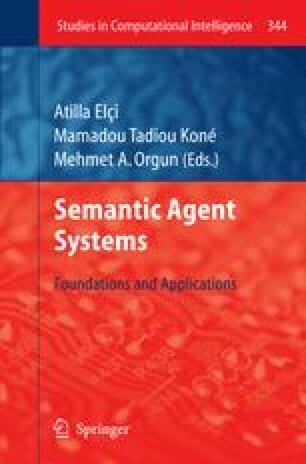 Human members of an organization are assisted by (semi-) autonomous rule-based agents, which use Semantic Web rules to describe aspects of their owners’ derivation and reaction logic. To implement different distributed system/agent toplogies with their negotiation/coordination mechanisms Rule Responder instantiations employ three core classes of agents - Organizational Agents (OA), Personal Agents (PAs), and External Agents (EAs). The OA represents goals and strategies shared by its virtual organization as a whole, using a rulebase that describes its policies, regulations, opportunities, etc. Each PA assists a group or person of the organization, semi-autonomously acting on their behalf by using a local knowledge base of rules defined by the entity. EAs can communicate with the virtual organization by sending messages to the public interfaces of the OA. EAs can be human users using, e.g., Web forms or can be automated services/tools sending messages via the multitude of transport protocols of the underlying enterprise service bus (ESB) middleware. The agents employ ontologies in their knowledge bases to represent semantic domain vocabularies, normative pragmatics and pragmatic context of conversations and actions, as well as the organizational semiotics.